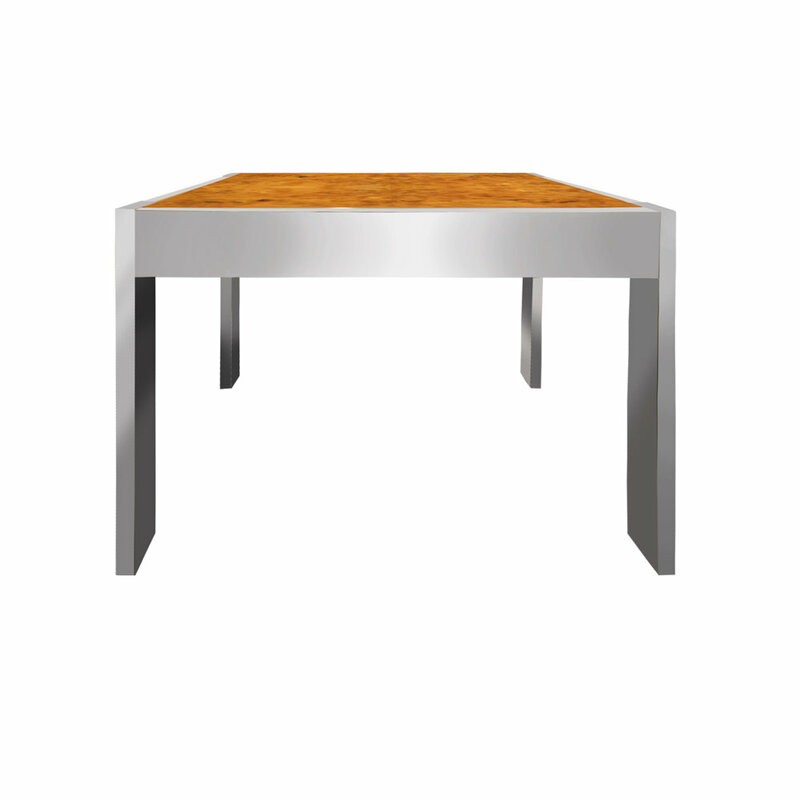 Dining table No. 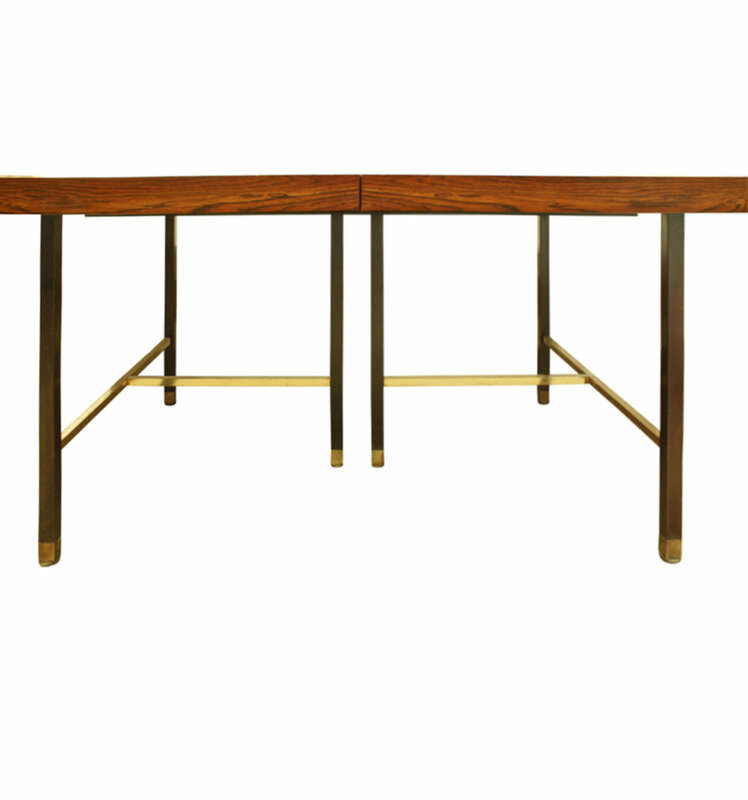 1287 in book-matched Brazilian rosewood with brass stretchers and mahogany legs by Harvey Probber, American 1950's. Comes with 2 additional leaves. 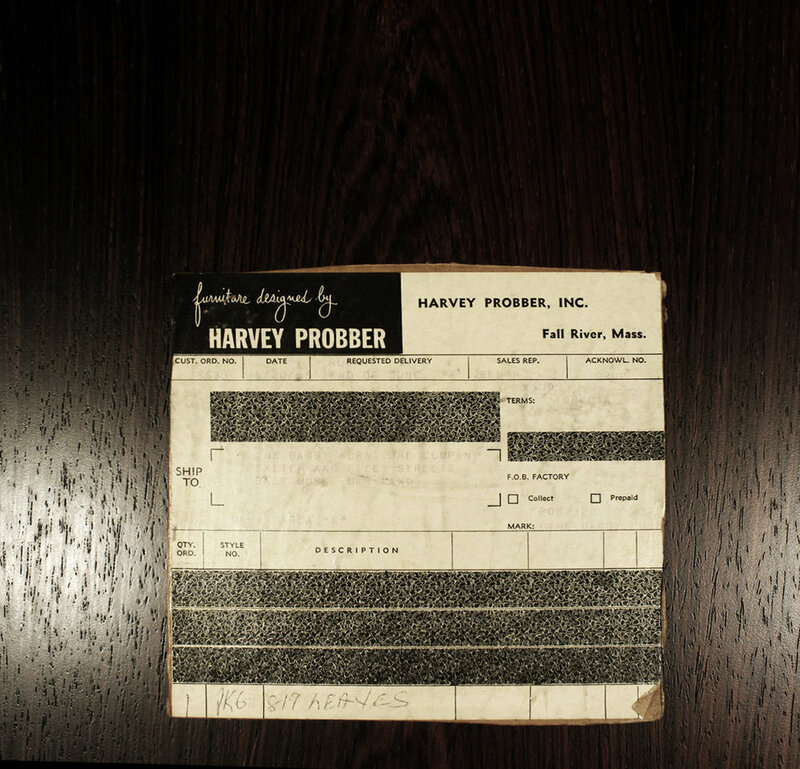 Signed with label on bottom that reads “Furniture designed by Harvey Probber”. This is an iconic Harvey Probber design. 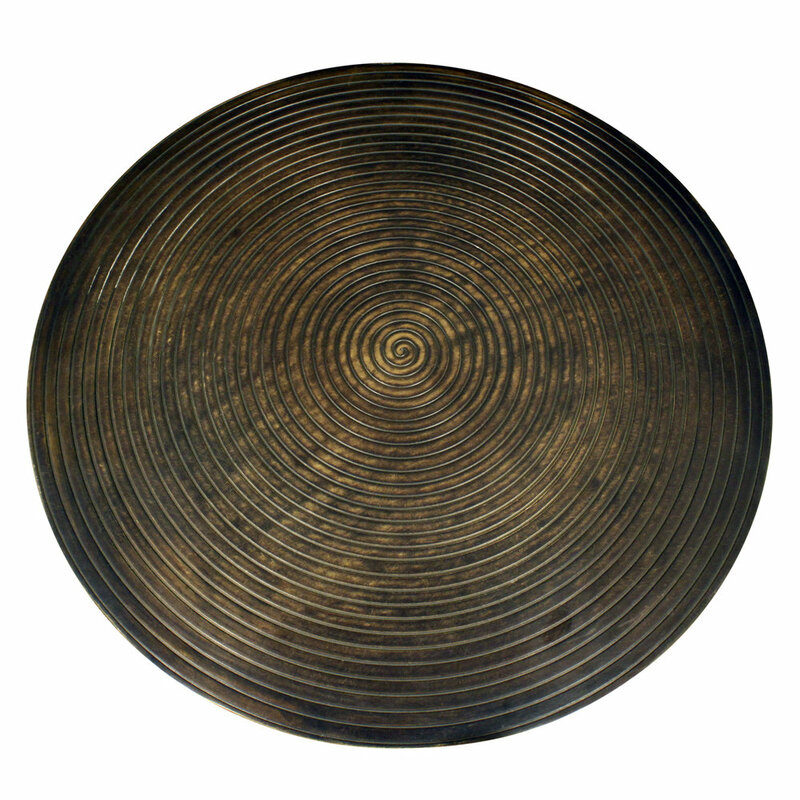 Round side table in bronze with concentric rings on top, American 1990's. 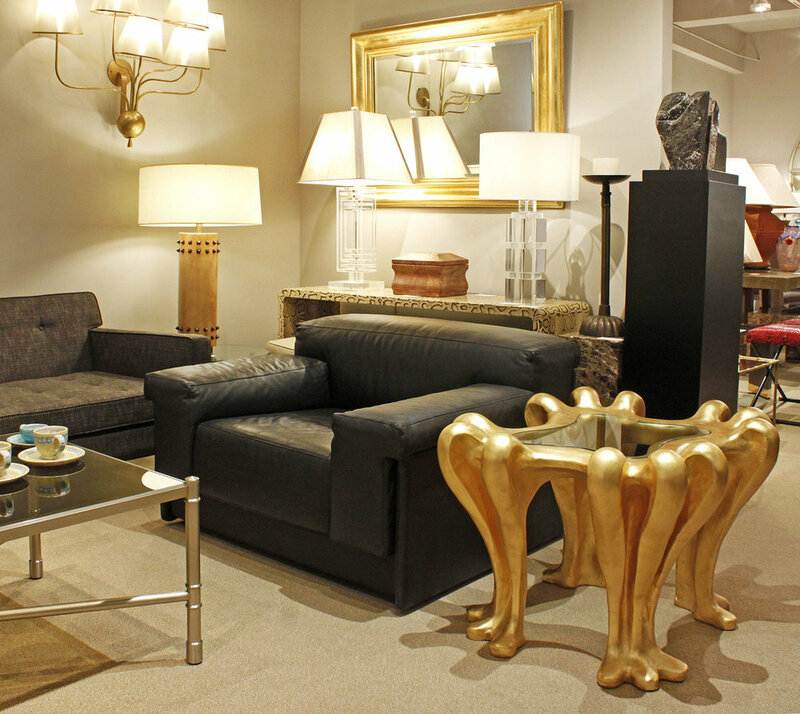 Inspired by contemporary design, it is a beautiful bold statement. 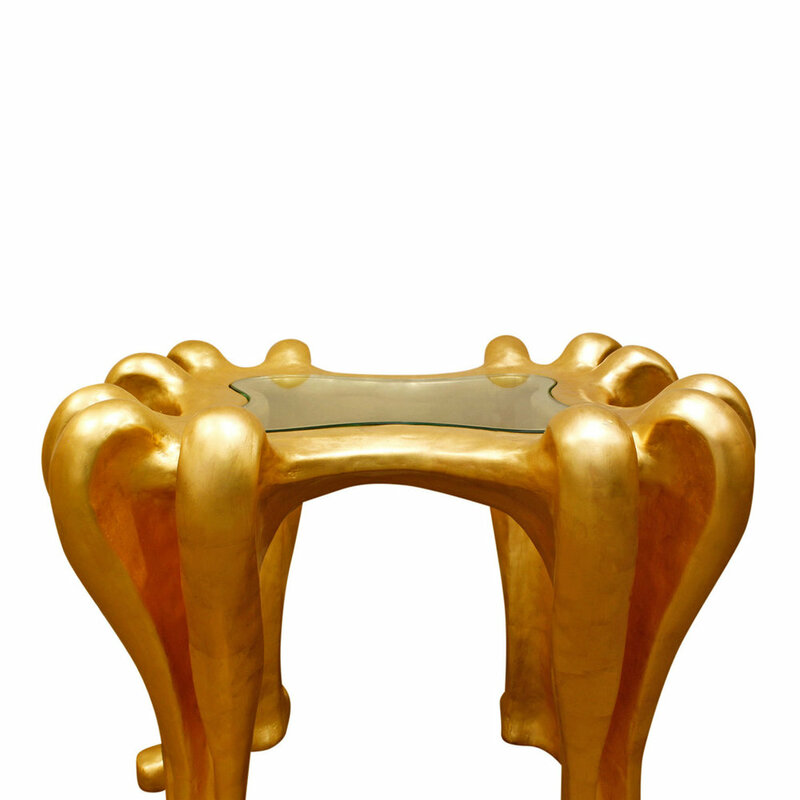 Sculptural side table in plaster with 24 karat gold leaf and inset glass top by Lawrence De Martino, American 2000. 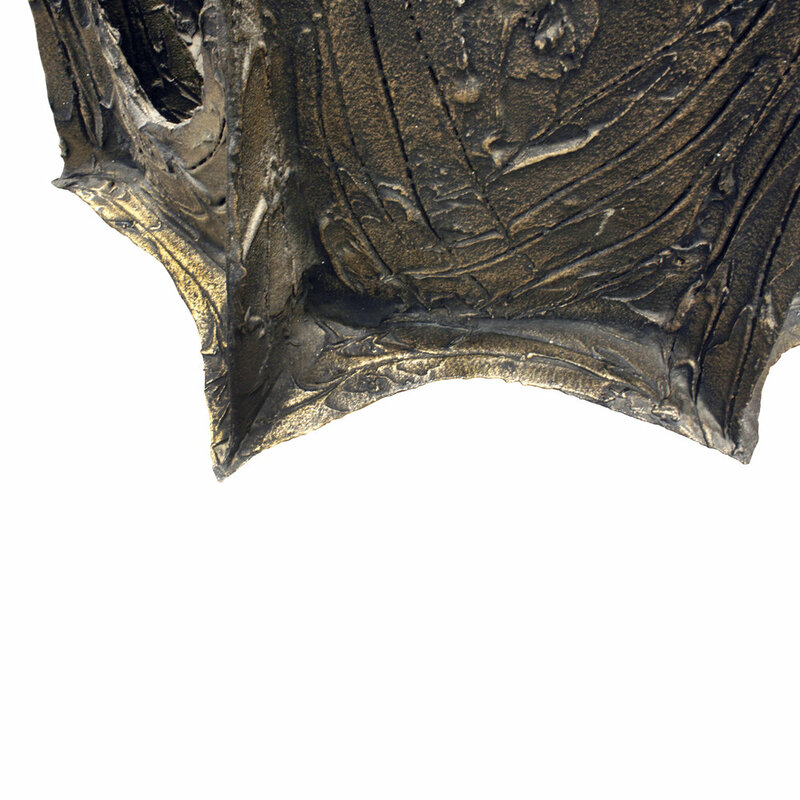 Not many furniture designers worked in plaster and De Martino’s pieces are exceptionally jubilant. 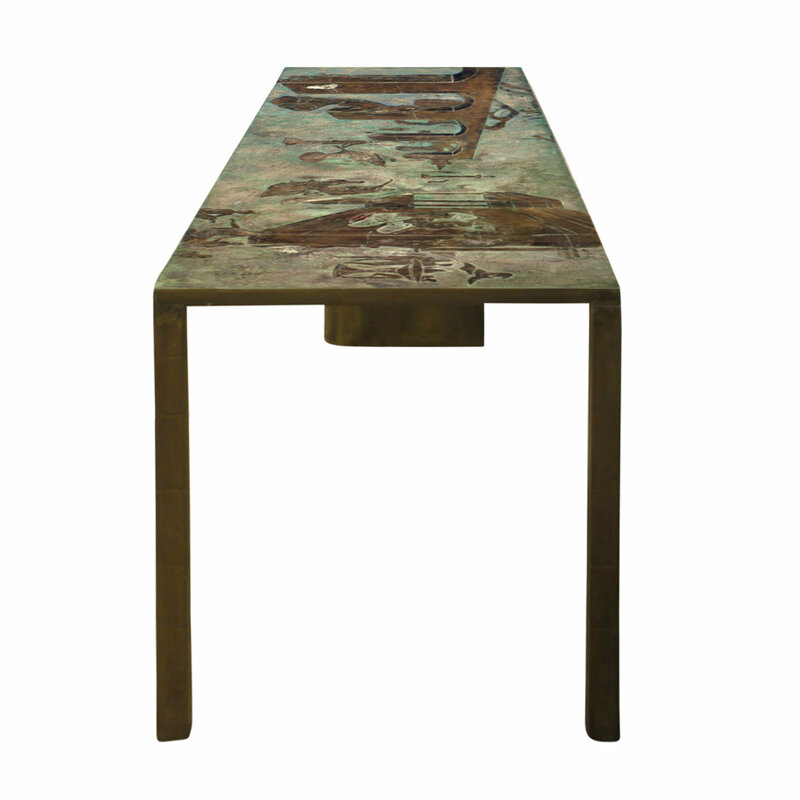 End table in chrome with lacquered book matched burl wood top in the style of Pace Furniture, Mexico 1970's. 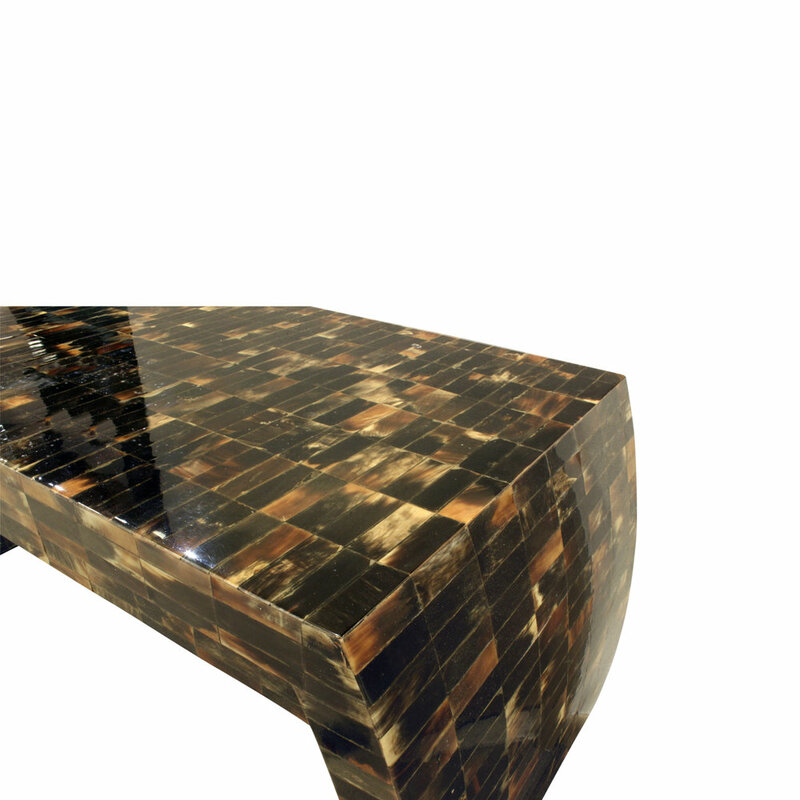 The combination of polished chrome and the burl wood is very striking. 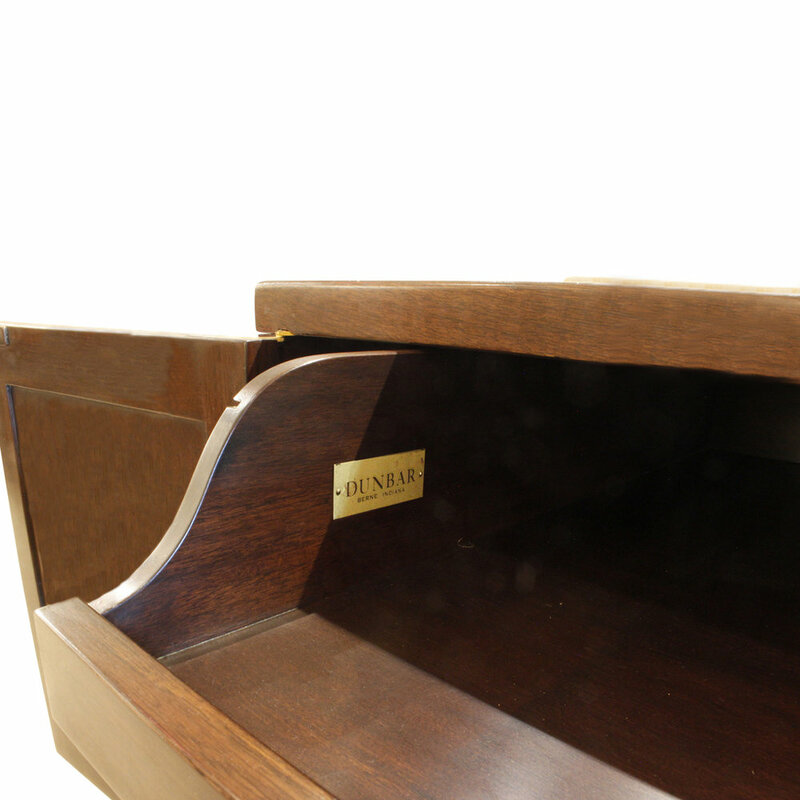 Pair of rare and important end tables, each with 2 doors incorporating antique Japanese printing blocks, by Edward Wormley for Dunbar, Janus Collection, 1957 (signed with Dunbar tags in drawers, paper label on bottom). 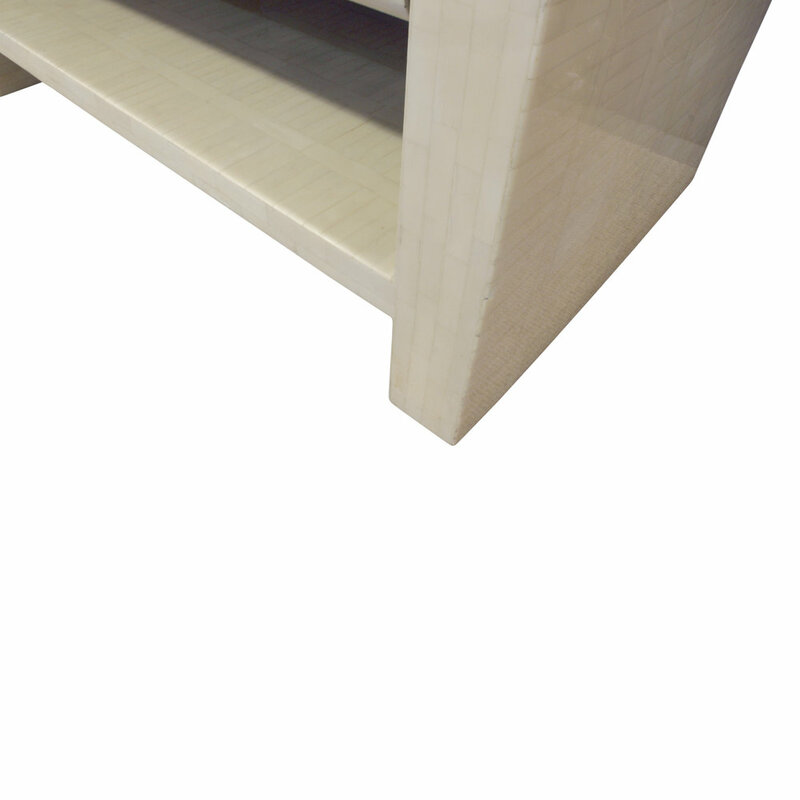 These were custom orders tables as the antique Japanese blocks were not a standard option on them. 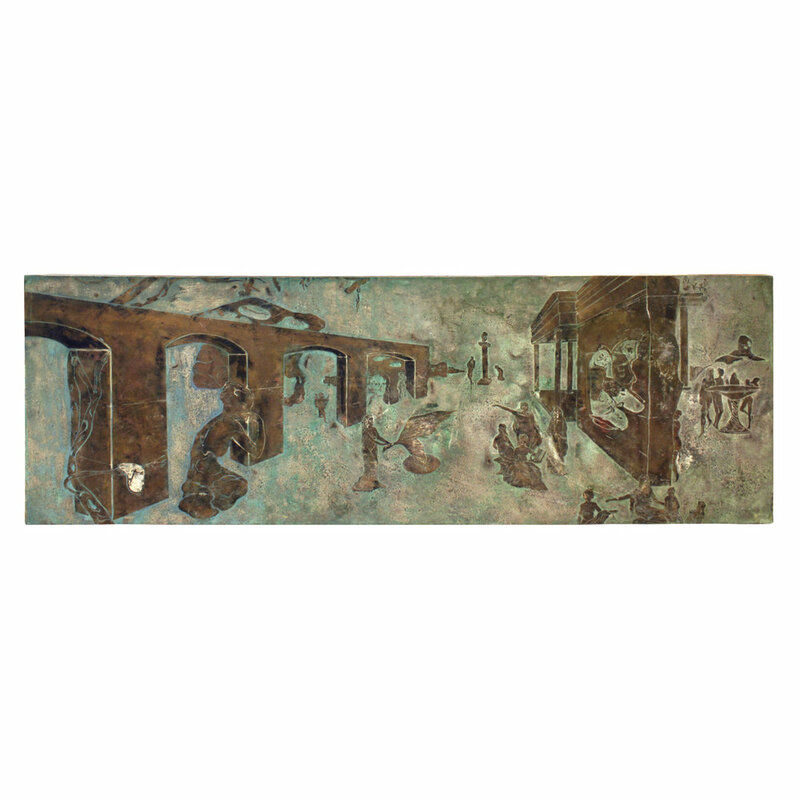 These are extraordinary representations of the Janus series, which focused on hand crafting in an era when everyone was moving to industrial production with steel and glass. 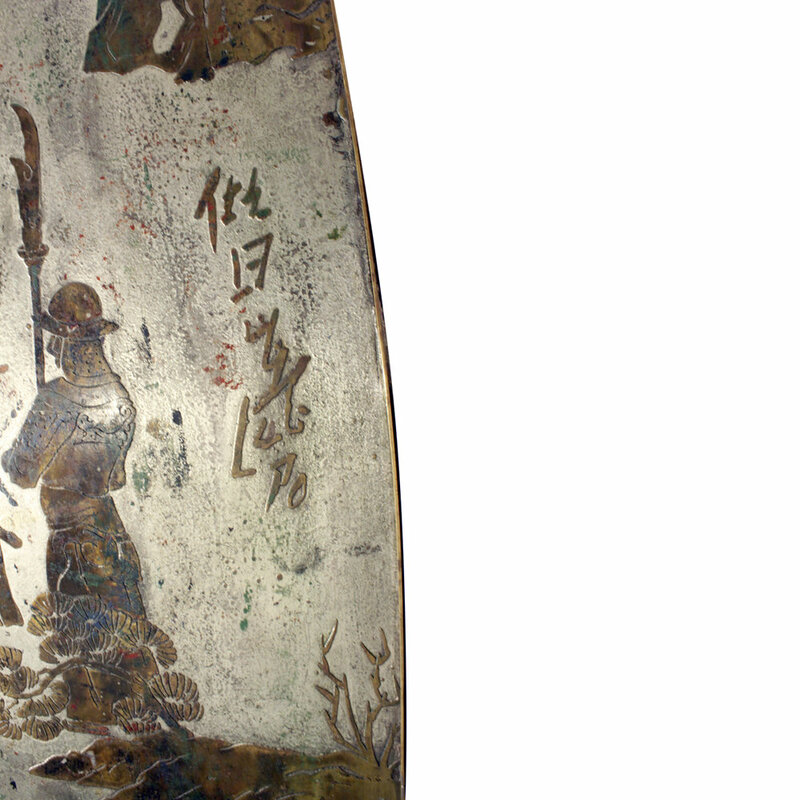 "Ming #133" coffee table in patinated bronze and pewter with hand painted polychrome enamels by Philip & Kelvin LaVerne, American 1960's. 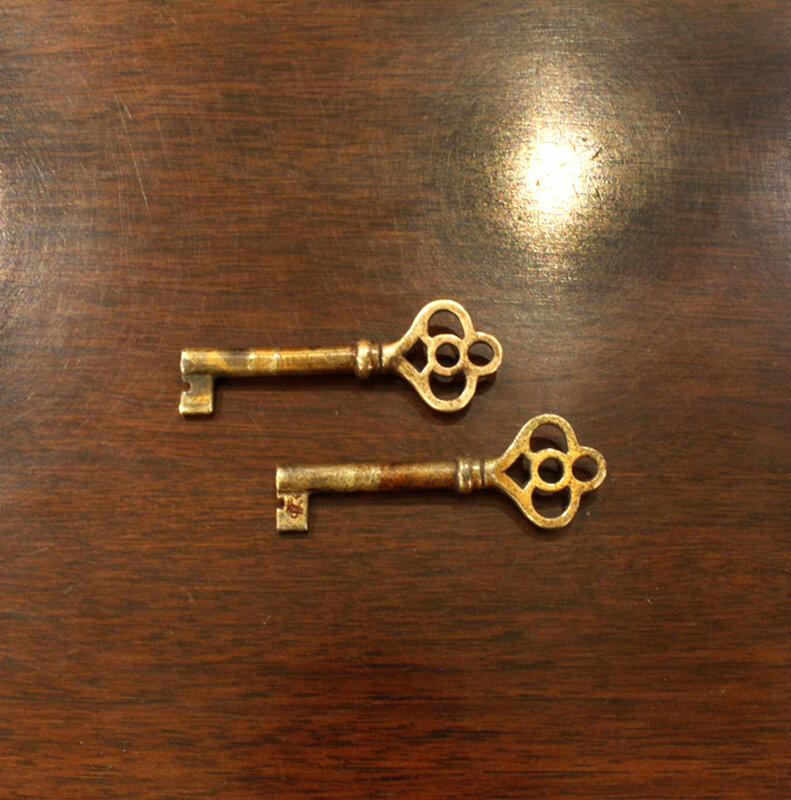 Signed on top “Philip + Kelvin LaVerne”. 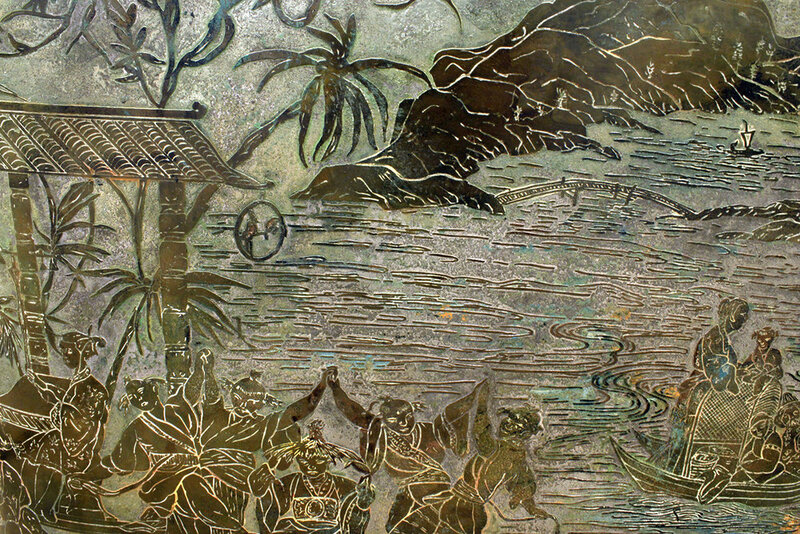 "Chan" coffee table in pewter and bronze with hand-painted Chinese scene by Philip and Kelvin Laverne, 1960's. Signed on top “Philip + Kelvin LaVerne”. This is the largest size this table was made. 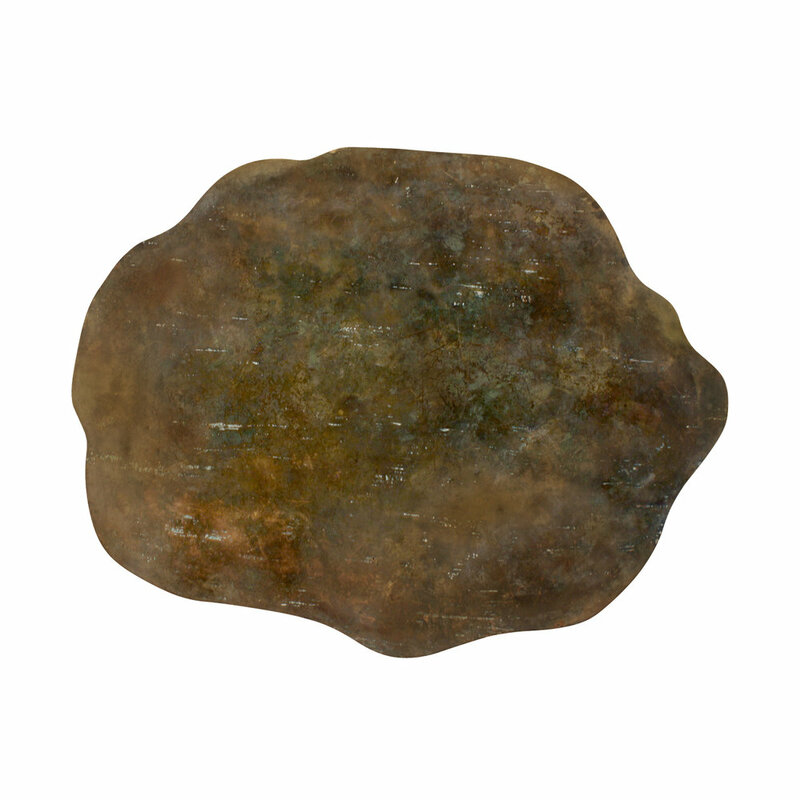 It’s impressive and has beautiful coloration. 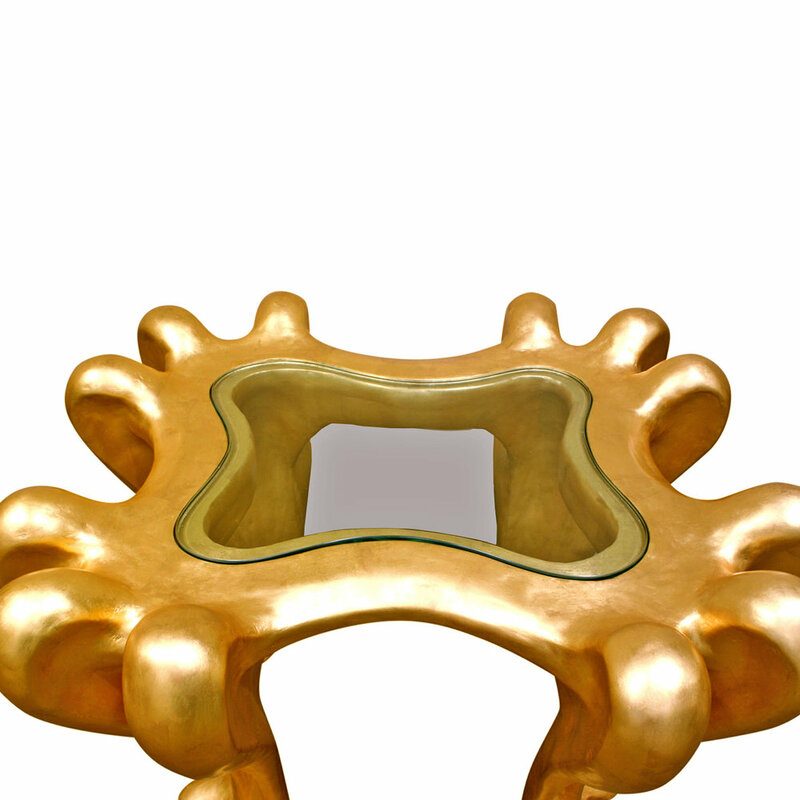 Rare and important "Viola" coffee table in patinated bronze with hand-painted enamels and glass top inspired by music by Philip & Kelvin LaVerne, American 1960s. 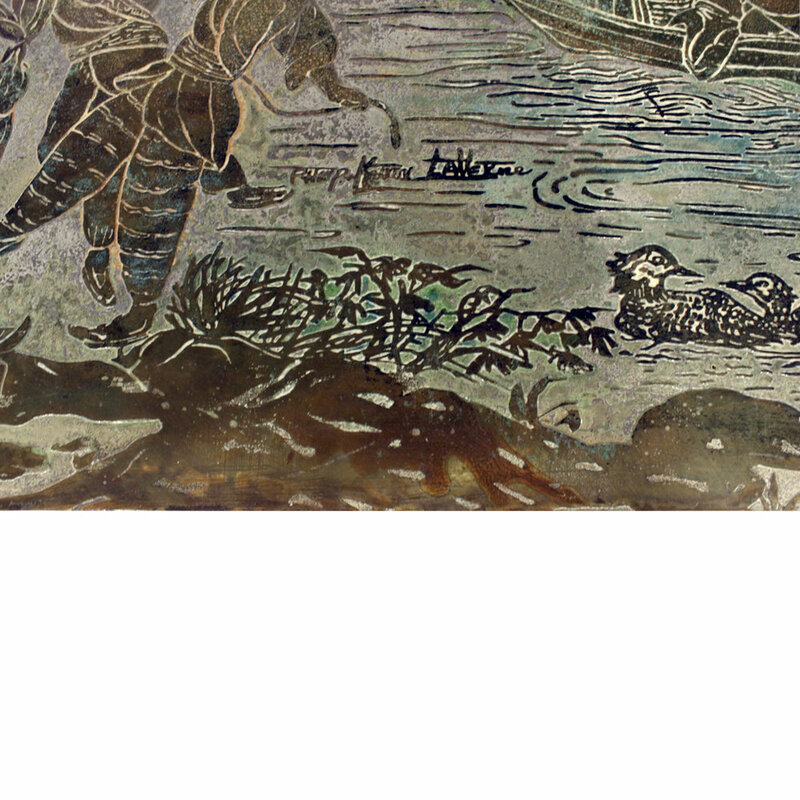 Signed on top by “Philip Kelvin LaVerne”. 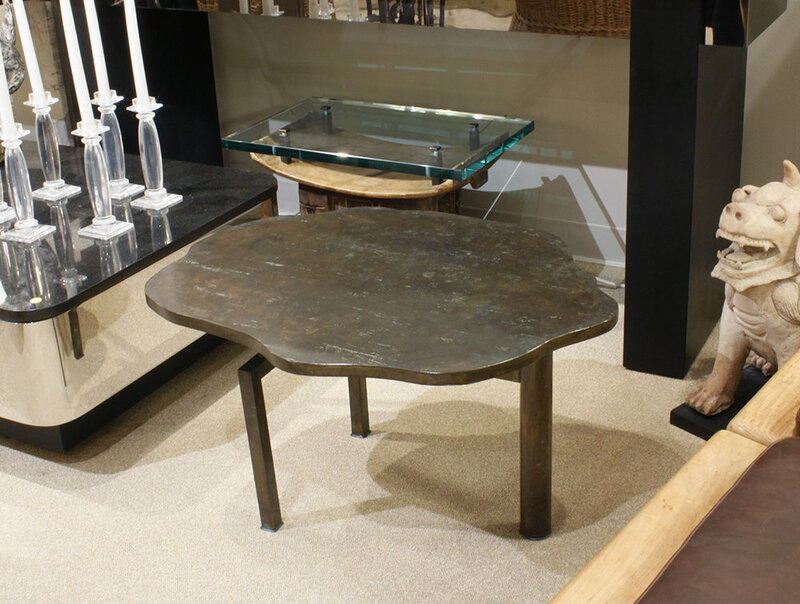 This table is unusual because of the negative space cut out under glass as part of the design. Truly exceptional. 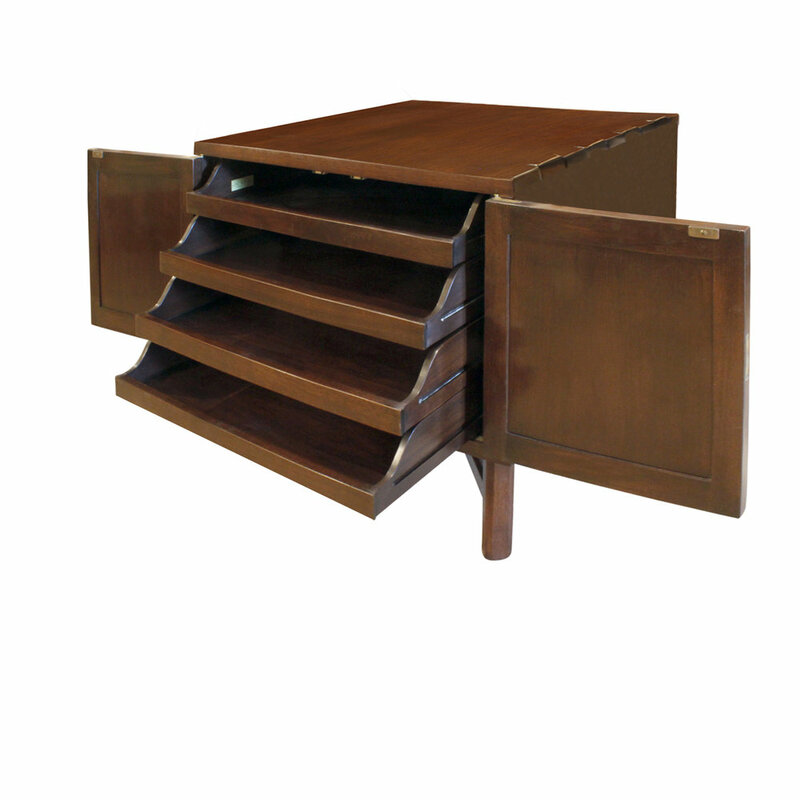 Console table in tessellated horn with curved sides and 2 drawers, made in Colombia, 1970's. 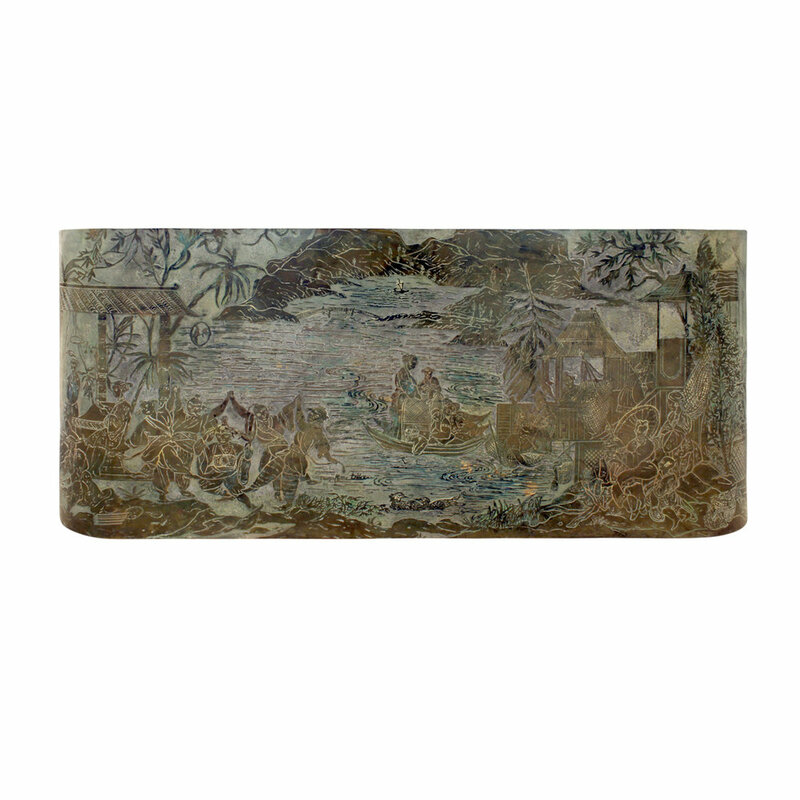 "Eternal Forest" coffee table in patinated bronze and pewter with hand painted polychrome enamels by Philip and Kelvin LaVerne, American 1960's (signed Philip + Kelvin LaVerne on top and has “Philip LaVerne Galleries LTD” on underside). 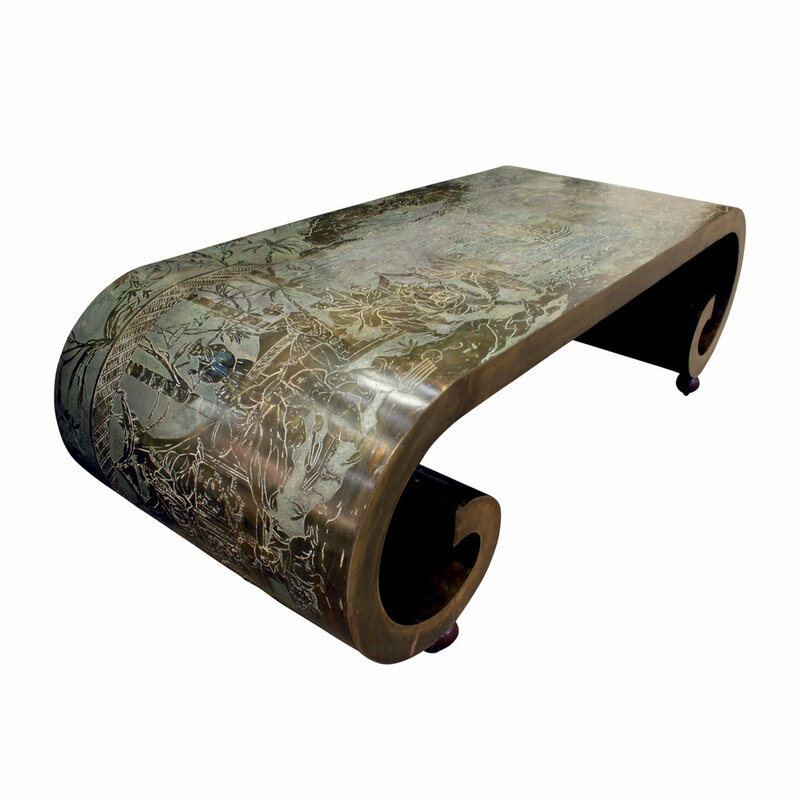 This rare table is an incredible work of art with its organic repeating natural motif. 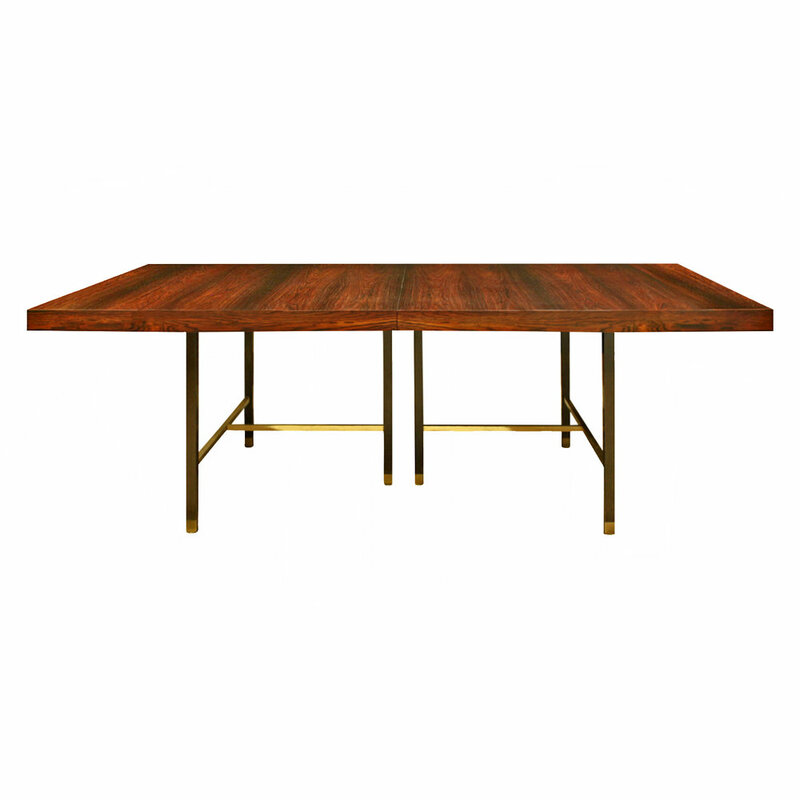 Large and exceptional "Regency Table" (dining/center/hall/game table) in lacquered pie-cut Anigre with inlays on top and forged brass feet by Karl Springer, American 1980's. 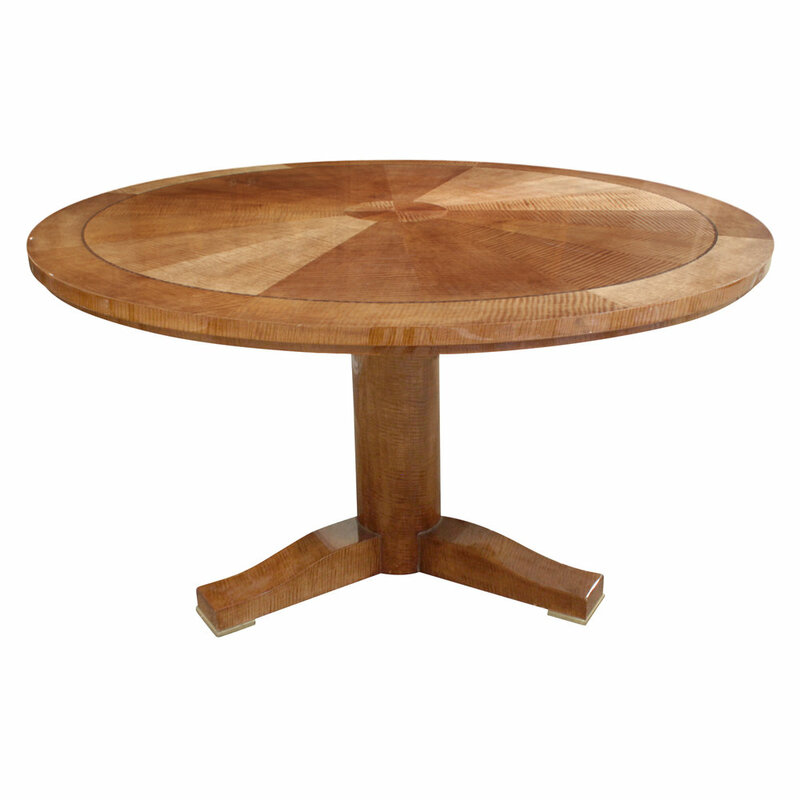 This table is a wonderful example of Springer’s unsurpassed craftsmanship. 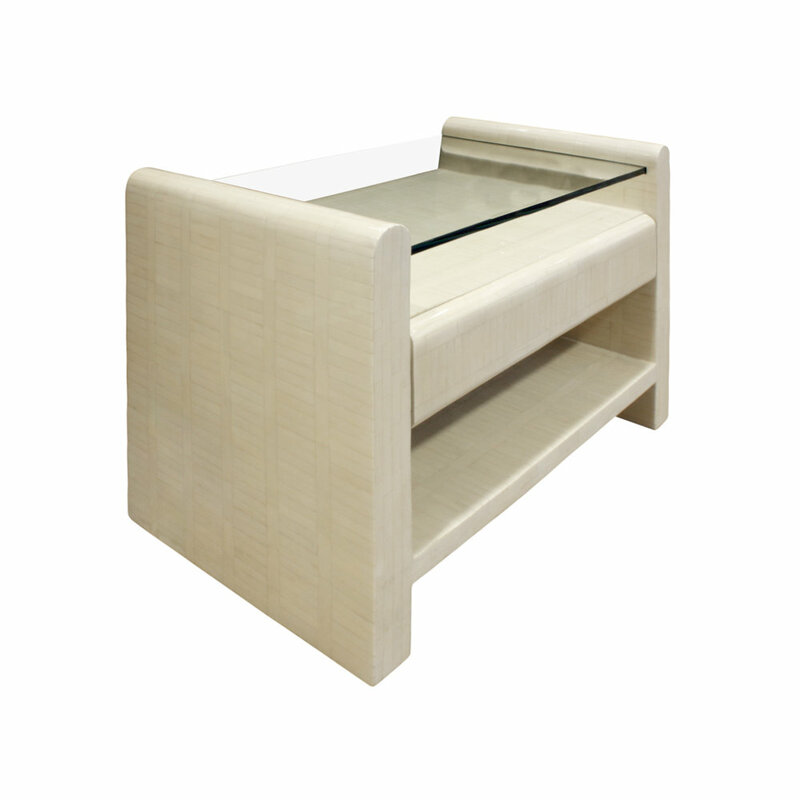 Pair of large bedside tables in lacquered tessellated bone with floating glass tops Colombian 1970's. 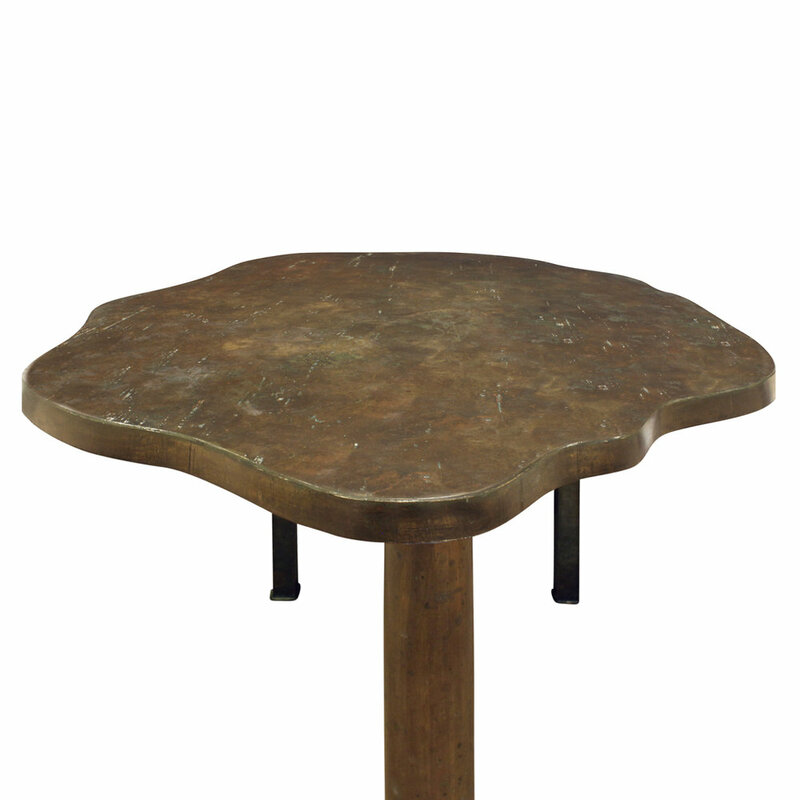 Rare sculptural "Turtle Table" in patinated bronze by Philip and Kelvin LaVerne, American 1960's. 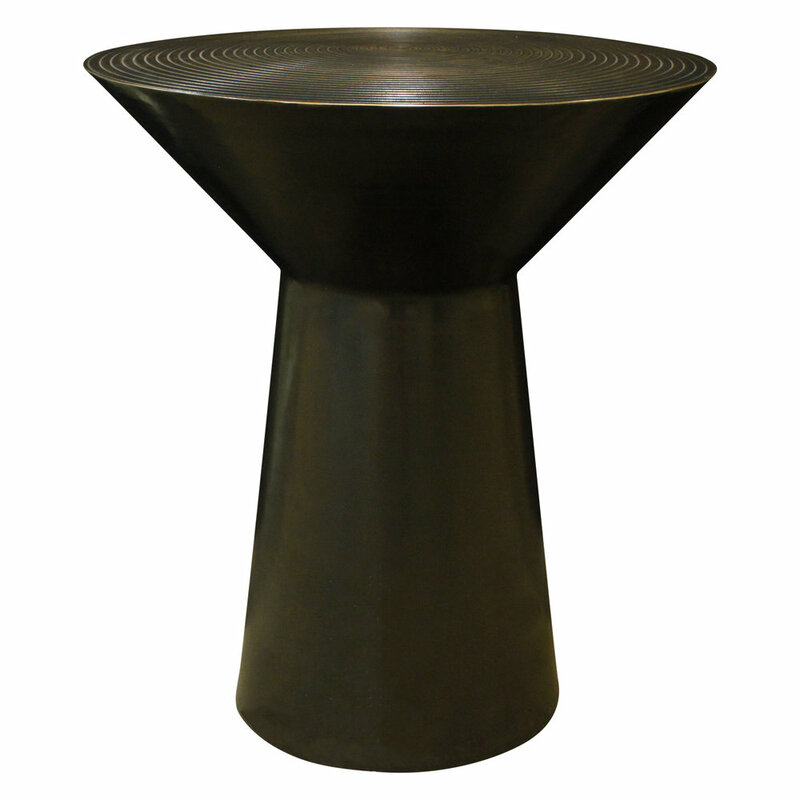 The top has an abstract tortoise shell-like finish. 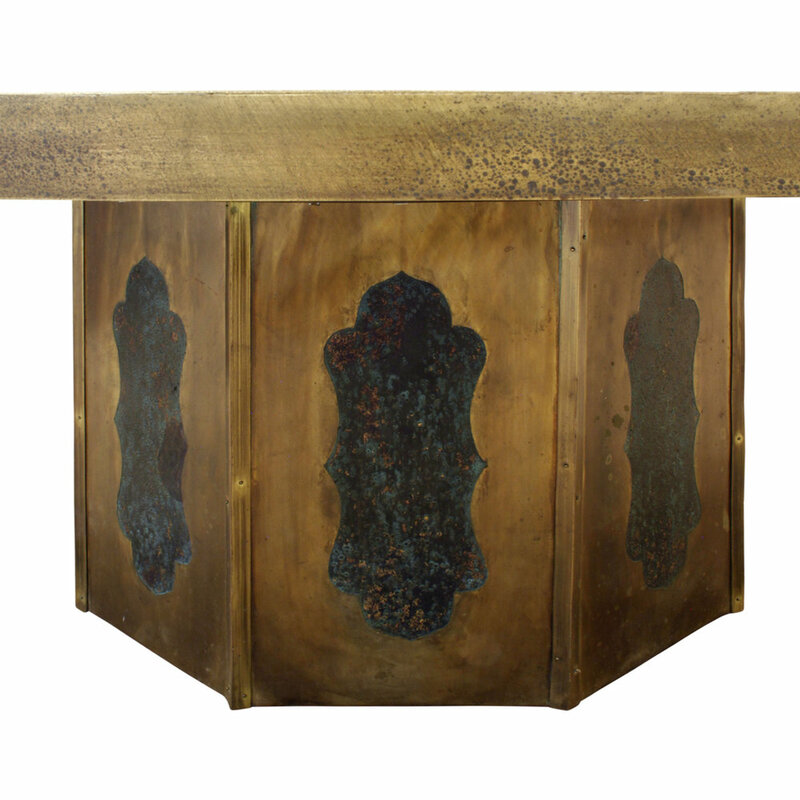 Rare "Surrealistic” console table in patinated bronze and pewter with hand painted polychrome enamels by Philip & Kelvin LaVerne, American 1960's (signed “Kelvin LaVerne” on bottom right on table top). This is an extremely rare table. 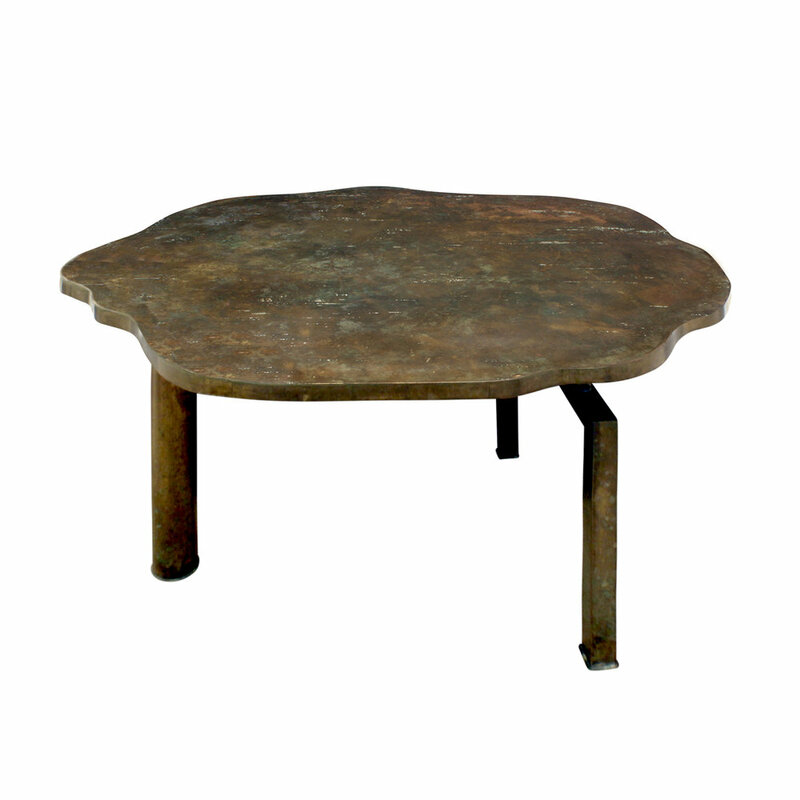 Large unique coffee table with abstract “Turtle Table” top reminiscent of tortoise shell in patinated bronze, pewter and hand-painted enamels with pedestal base by Philip & Kelvin LaVerne, American 1960's (signed Philip + Kelvin LaVerne on the side). 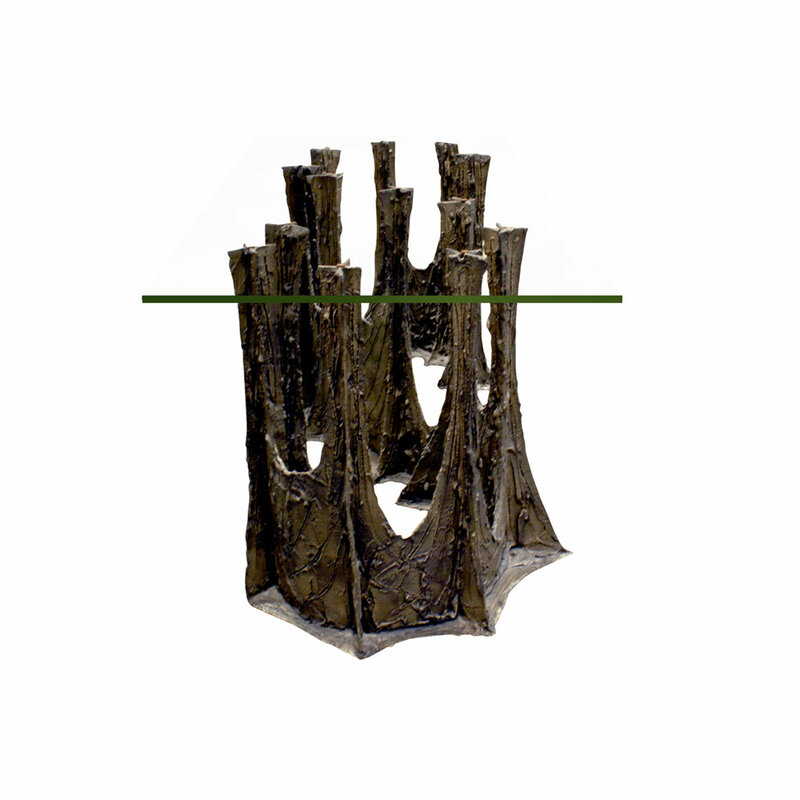 It is rare to see this abstract design done for a large coffee table top. 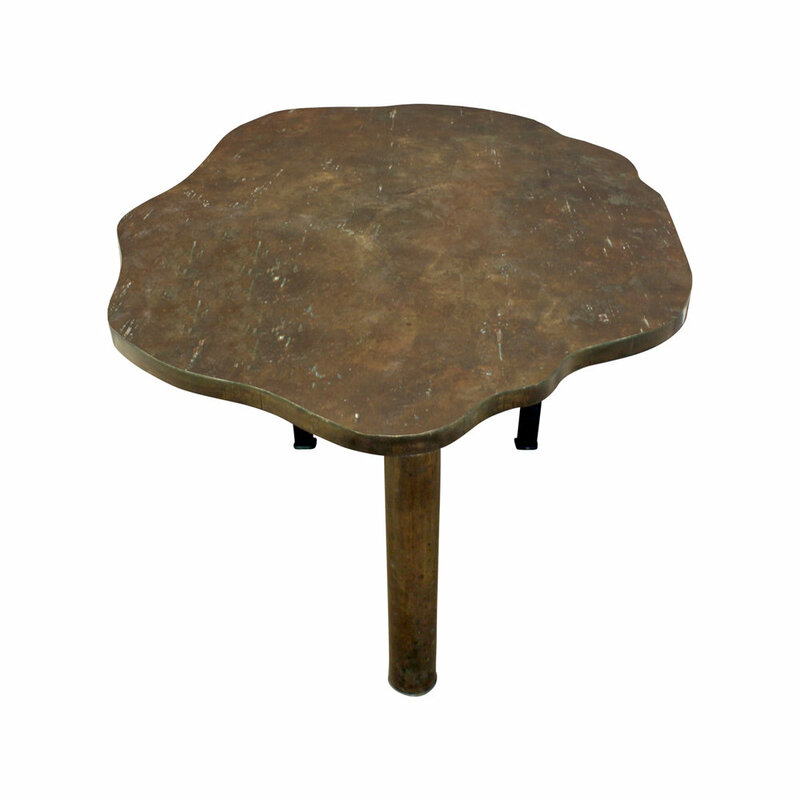 Sculptured metal dining table model No. 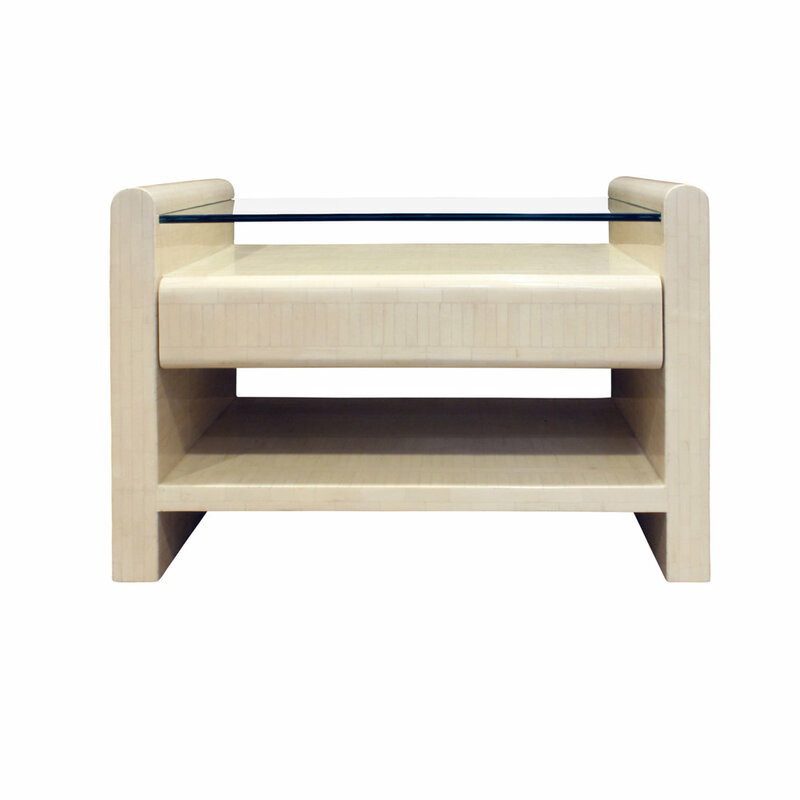 PE 102 in bronze composite with thick glass top by Paul Evans for Directional Furniture, American 1969. Signed and dated “P.E. 69” near the bottom of the base. 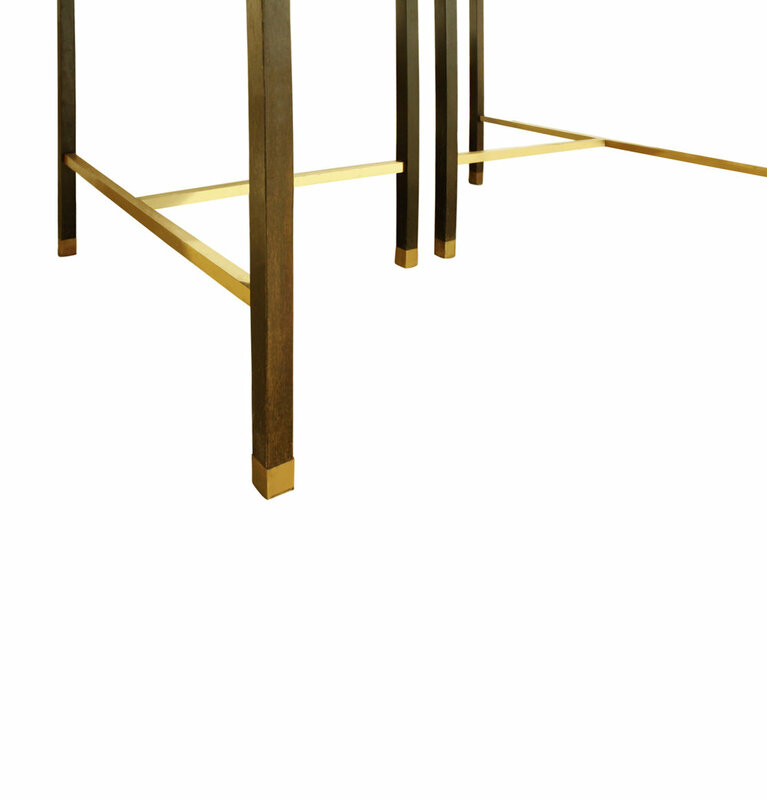 This iconic dining table is a wonderful example of Paul Evans’ unique sculptural designs. 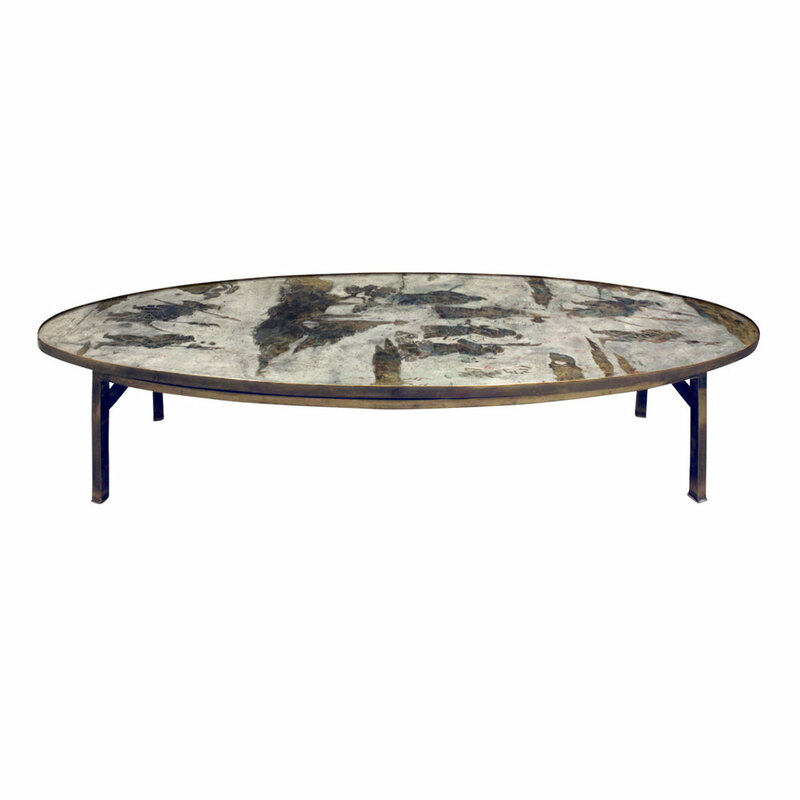 Large "Chan" coffee table in patinated pewter and bronze with hand-painted enamels by Philip and Kelvin Laverne, 1960's (signed “Philip + Kelvin Laverne” on top). 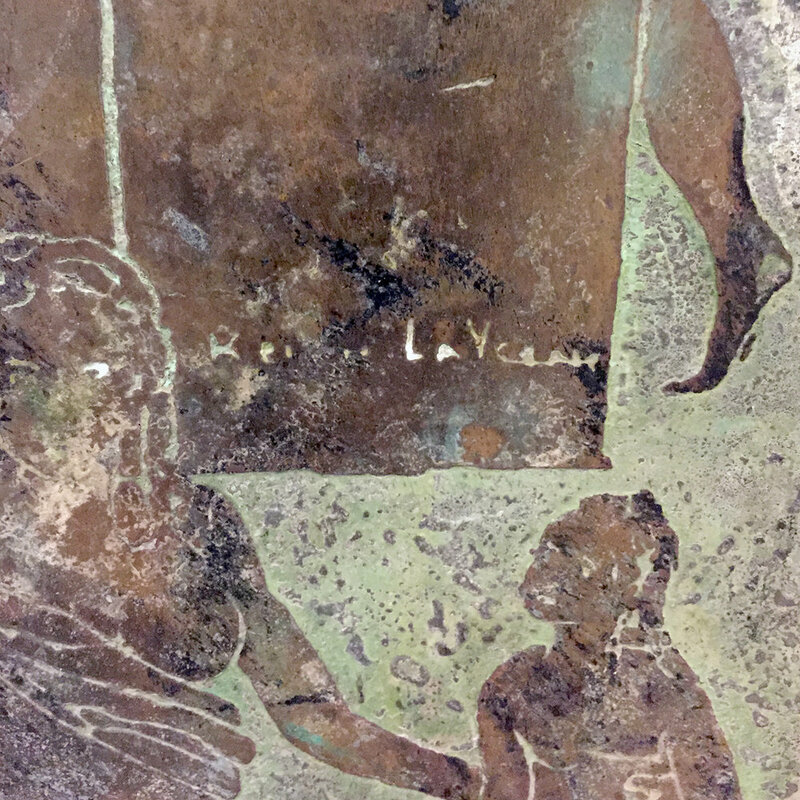 This table has wonderful coloration and is an iconic example of the LaVernes’ unique art. 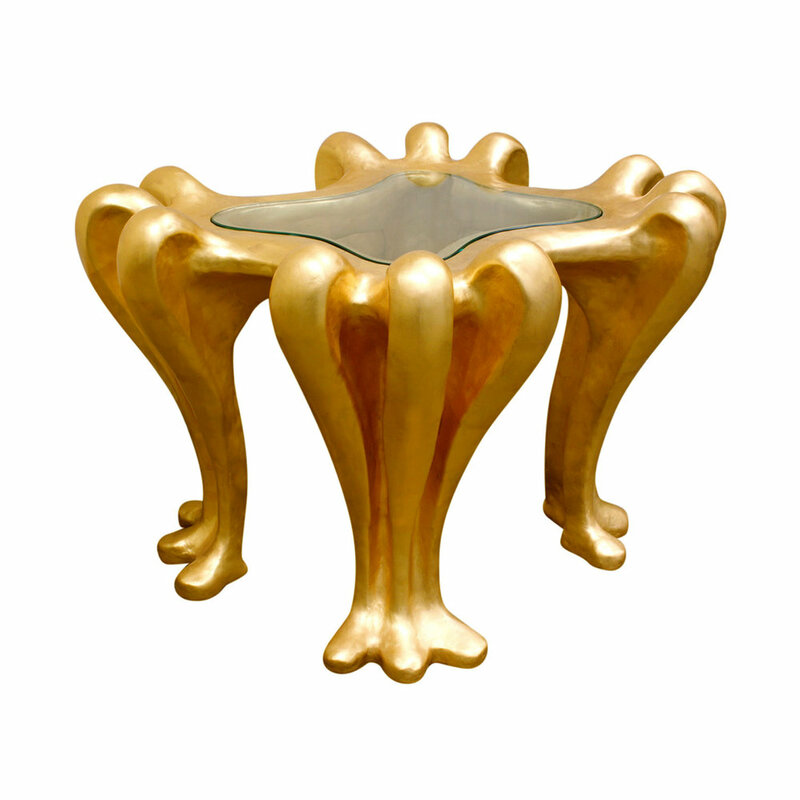 Rare and Important "Eros Side Table” in cast bronze with thick glass top by Philip & Kelvin LaVerne, American 1970's (signed "K Philip LaVerne" on the edge of base). 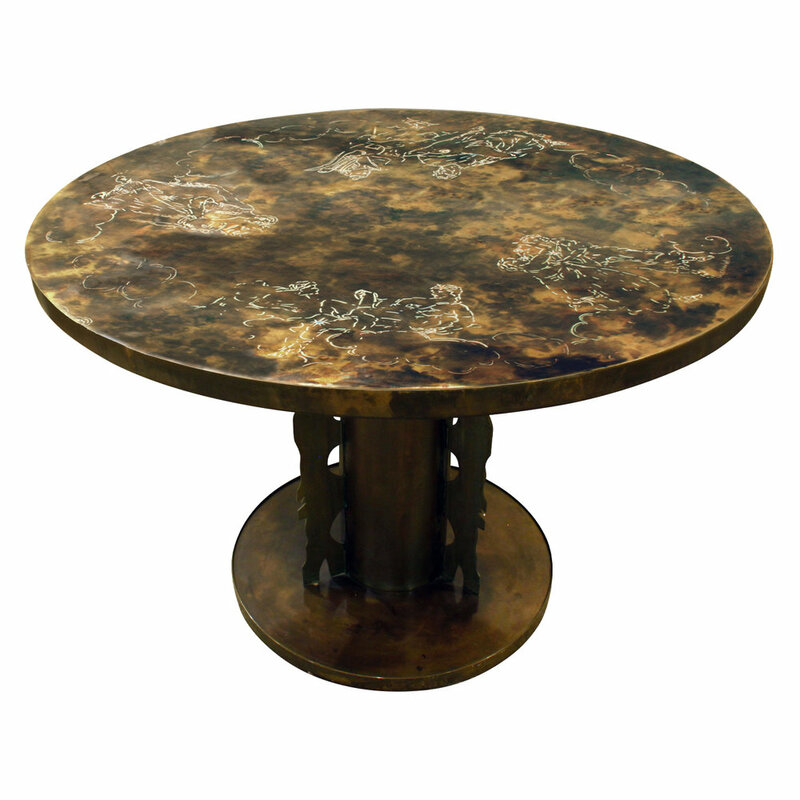 Round "Classical Table" in patinated bronze and pewter with etched figural design incorporating hand painted enamels by Philip & Kelvin LaVerne, American 1960's. Signed “Philip & Kelvin LaVerne” on top. 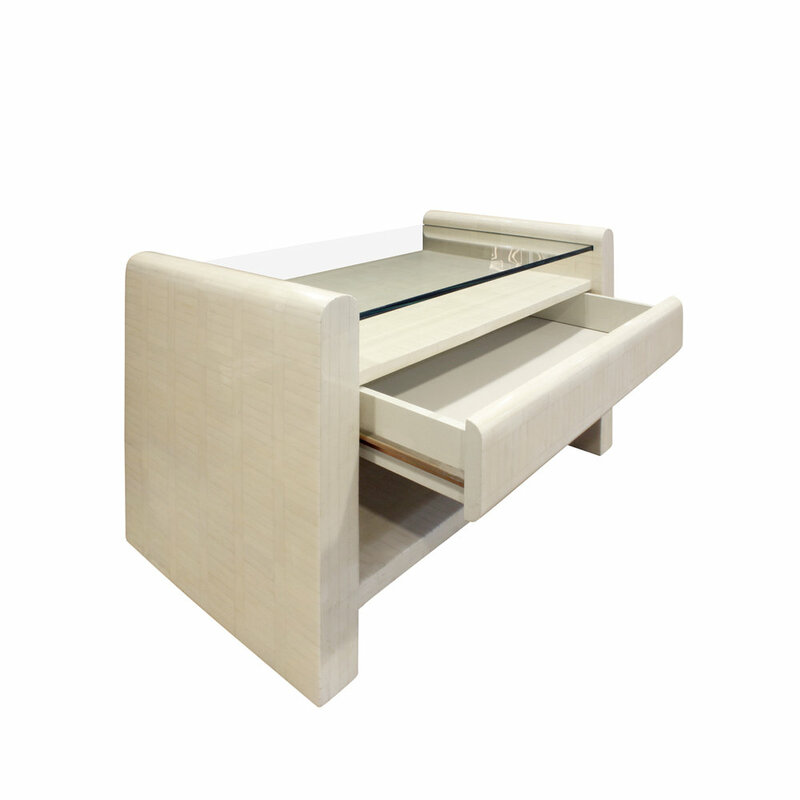 This can be used as a center / hall table, game, or dining table. 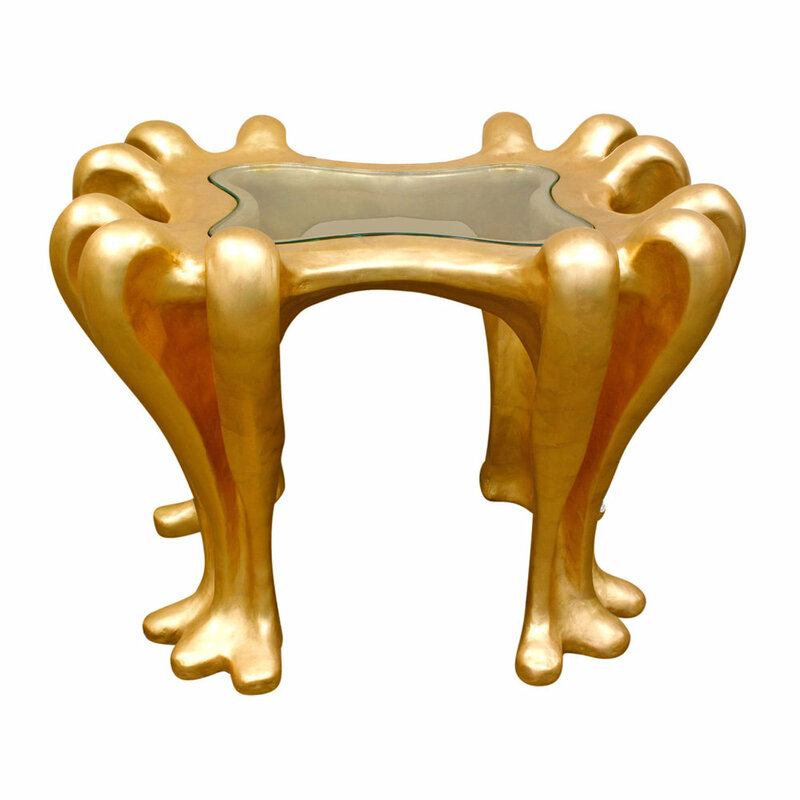 This is a rare and exceptional table.